Welcome to our Open House series. Every quarter we open the doors on our data to share information about our community, investment performance and measures of liquidity in the Resale Market. The series is born of our commitment to data transparency, and we hope you find it useful. The figures above are correct as of September 30th, 2018. Figures in green represent a net change in the displayed figures from the previous quarter ending 30 June 2018. The chart above highlights how investment through the platform has grown since its inception in January 2015. The figures above are correct as of September 30th, 2018. We pay rental income on the 5th of each month, on properties that have fully funded, completed and are trading on our secondary market. In some cases, we have managed to secure higher rent than originally forecast when the properties were listed on the platform. All our properties are independently valued by a RICS qualified Chartered Surveyor at purchase, and then periodically thereafter. Residential properties are revalued every six months on 31 March and 30 September, and Purpose-Built Student Accommodation and commercial properties are revalued yearly on 30 September. All revaluations go live on the platform on the 5th of the following month. To learn more about the latest quarterly valuation and performance on platform, click here. The surveyor’s valuation feeds into the Latest Share Valuation for each property, along with mortgage debt, amortised purchase costs and any deferred tax applicable to capital gains. You can download an Excel tracker of the historic share price movements below. The Excel tracker is updated monthly and will allow you to track the performance of each individual property. Investors can realise a capital return by selling shares on the Resale Market at any time, by placing an offer to sell at their chosen price or matching an existing bid order. Alternatively, investors can exit at market value five years after a property’s launch on platform. (Read more about 5-yearly mechanics here). Investors looking to purchase shares on the Resale Market can match a sell offer or place bids at their chosen price. Learn more about how the Resale Market works, here. The figures above are correct as of September 30th, 2018. Past performance is not a reliable indicator of future performance. We have also prepared a full download of Resale trading activity, including all transactions matched through bids. This spreadsheet allows you to review trading by property, including the trade date, trade price, premium to Initial Valuation, and premium to Latest Share Valuation. We will continue to share information and data, to give investors a clear view on our performance. 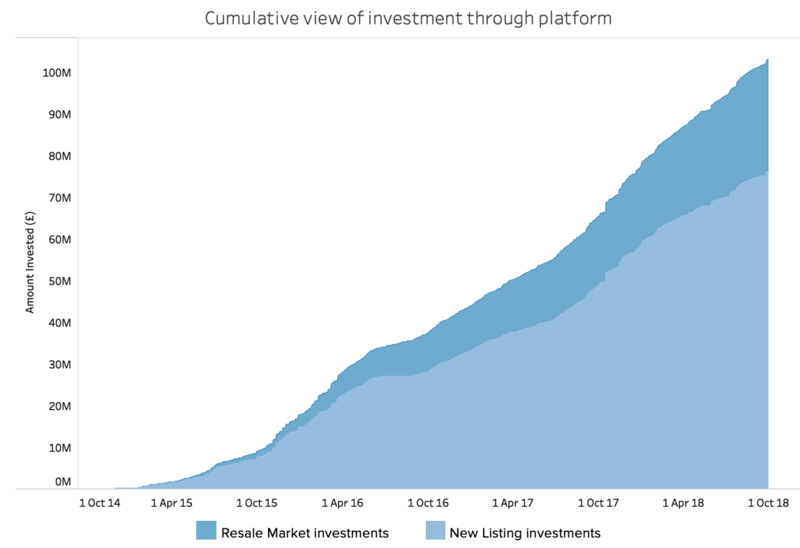 For those of you who are not yet investors, we hope that this data will help you make an informed decision as to whether to invest in properties through our platform. 1. ‘Capital returned to investors’ denotes the total value of shares sold on the Resale Market. 2. ‘Units Funded’ refers to the number of individual flats or houses that have been funded to date. 3. ‘Investments Funded’ refers to the total number of properties that have fully funded on the platform. 4. ‘Matched by bids’ refers to the total value of shares sold, resulting from bid orders being matched. 5. ‘Portfolio traded on Resale Market’ is the total value of shares sold on the Resale Market as a percentage of the total value of New Listing investment. 6. ‘Time to sell’ denotes the weighted average time it has taken to sell shares at or below the 30-day weighted average share price.